Blog — Horticulture Is Awesome! Hunters and gatherers have existed for thousands of years. We as a species relied heavily on it before the discovery of agriculture. In fact, our brains are still programed to notice patterns in nature so that we could be better foragers of this great planet. Creative exploration is central to science, art, and cognitive development (Yuval Hart, 2017). Today, we have become more resourceful in food production but that doesn’t mean that our very own backyards lack a bountiful harvest. For this post I will focus on food; however, know that medicine, tools, and even wisdom can be found past the tree line of your urban environment. Foraging requires patience, understanding, and most of all a strong background in identification. Anything is edible; somethings are only edible once! It is important that you know what you’re harvesting from the land before you actually harvest it. Without proper identification, you could be putting you and those you love at risk of sickness and death. Also, know your environment. Places not far from urban development have high risk-factors of contamination, so be cautious and knowledgeable (Department of the Army, 2009). Purchase a field guide, and do plenty of research on native (and non-native) poisonous plants, mushrooms, and animals. Be sure you are not trespassing as well! In East Texas, we are lucky to have such an abundance of edible plants and mushrooms. Many are chalk full of vitamins and nutrients, and they come with no monthly subscription, fee, or price. It’s all yours if you’re willing to work for it. Blackberries, greenbrier, sumac, mulberry, passion-vine, and cattails are a few plants I can name that are readily available (and this list doesn’t include the medicinal ones). Oyster, morel, and chanterelles are commonly sought after mushrooms in this region that are prized edibles to the local foragers, too. The vast majority of plants are neither edible nor poisonous, they’re just not very palatable or digestible (Elpel, 2004). Until 12,000 years ago—i.e., before the Neolithic revolution—virtually all humanity lived as hunters and gatherers (Svizzero, 2016). This fact means we have thousands of years of plant-based knowledge, paired with the recent knowledge of how chemistry works. Why am I bringing this up? Because there is no excuse to risk death over a tasty looking plant while foraging. It cannot be stressed enough, and this blog is intended to stress the importance of that before you consider becoming a part-time forager. Education is the key ingredient of identification. Don’t embarrass your ancestors. What you need to know next is what parts are edible. Some plants have specialized storage units knows as tubers while others simply offer only edible flowers and buds. Some plants are only edible during certain seasons, and others all year-round. So, the best advice I can give is to research native edible plants in your area and make a field guide! Note plant parts, seasonal harvest conditions, cooking requirements, and anything else you may find useful in the field or during processing time. Processing is something with which we are all familiar, and if you are lucky enough to gain a bountiful harvest, you’ll want to process your food. Pickling, drying, cooking, storing, canning, and freezing are included during this process. You’ll sometimes spend twice the amount of time processing your foraged treasure as you did finding it. Remember that your safety comes first. The internet can offer valuable information but only if it is coming from a reliable source. Wear proper clothing, have fun, and enjoy the benefits of finding free food while getting exercise and breathing in that amazing clean air! Department of the Army. 2009. The Complete Guide to Edible Wild Plants. Thomas J. Elpel. 2004. Primitive Living, Self-Sufficiency, and Survival Skills: A Field Guide to Primitive Living Skills. Yuval Hart, Avraham E. Mayo, Ruth Mayo, et. al. 2017. Creative foraging: An Experimental Paradigm for Studying Exploration and Discovery. Hi, my name is Anna Claire, and I am a horticulture student at Stephen F. Austin State University in Nacogdoches, TX. As a child, the happiest memories come from beautiful experiences. Growing up, I found that the most extraordinary reality in life comes from the creation of magnificent surroundings. Today, I will be covering the topic of child-friendly gardening, and incorporating the importance of color, learning, and simple garden practices. A student’s perception on a specific outdoor space has been directly connected to their working with the landscape itself (Muderrisoglu and Gultekin, 2015). Having a basic knowledge of gardening allows children to see the fun that can come from working with a landscape (Holmes and Lewis, 2013). Working at the Plantery, our micro-farm and teaching garden at SFA, has given me many opportunities to teach children about plants. We frequently have young students visit for educational events. We give them a tour of our gardens and have them plant a plant to add to our collective landscapes. Last fall, we had a mass planting of our in our herb bed with some high school students from the area for college experience day where we planted a variety of ornamental vegetables. These included Beta vulgaris (Swiss chard) and a few lettuces including Lactuca sativa 'Tango' and Lactuca sativa 'Buttercrunch'. The addition of these vegetables to our landscape is a nice contrast to the usual cut flowers and herbs that might be expected. When teaching up and coming students, it is important to emphasize the different opportunities available with gardening and the variety of options for any landscape. Foodscapes have become a staple in society today, and if we learn about the importance, convenience, and potential of placing veggies in the landscape at an early age, we could change the face of horticulture forever. Some of the best forms of landscapes are unique ones, which is what we try to instill within our youngsters. One way to make a landscape more unique is by the addition of a wide variety of color, which is also conveniently very enjoyable for children to learn about. Gardens can provide a haven of all the colors available to the world, and fortunately, at SFA we have a variety of colorful plants just out our back door! One of my personal favorites is Symphyotrichum oblongifolium (aromatic aster) because of its vibrant purple color. It provides a delicate lushness to any landscape with a very full, branched system (Armitage, 2008). Another one of my favorites, due to its texture that looks like velvet and dark magenta color is Celosia cristata (cockscomb), which looks like something out of a Dr. Seuss book. Gomphrena globosa (globe amaranth) is an example of a colorful, textured, and a picturesque spherically shaped inflorescence. Simply put, the more visually entertaining a plant, the more interesting the landscape, which increases the chance of students becoming more intrigued in the learning experience. Overall, by simply teaching children about the variety of landscape options, we are planting the seed for a beautiful future. People all over the world are recognizing and continuing to explore the importance of having plants in the lives of students (Lucas, 1997). I have faith in the continual adventure we call the future of horticulture. I hope you will join me, shovels and water hoses in hand, in cultivating excitement and interest in the next generation of agriculturists. Together, we can improve the world of plants! Armitage, A.M. 2008. Herbaceous Perennial Plants. 3rd edition. Stripes Pub Llc. Champaign, IL. Holmes, L., E. Lewis. 2013. The Beginner’s Guide to Gardening. Plant Friendly Publishing. Upper Saddle River, NJ. Lucas, B. 1997. Learning Through Landscapes: The Importance of School Grounds. Australian Journal of Environmental Education. 13:85-88. Muderrisoglu, H., P.G. Gultekin. 2015. Understanding the Children’s Perception and Preferences on Nature-Based Outdoor Landscape. Sage Journals. 24(3). By Jocelyn Moore, SFA Student and Assistant Education Coordinator at SFA Gardens. Jocelyn was a student in our Fruit and Vegetable Production class. Need a feel good minute? Watch this short & super sweet video of school gardens in Nac! I have never seen more joy radiating from children than during their first carrot harvest. The green, frilly tops popping out of the earth give no indication that a familiar root awaits below. Almost every time I've witnessed this scene, the child tugs and unearths their prize triumphantly, waving the carrot like a trophy above their head. This story, amidst countless others unfolding weekly in our school gardens, is just one small example of how and why children are embracing fruits and vegetables. With this level of engagement, it’s easy to see why garden-based, experiential learning is a powerful tool for teaching a wide range of subjects—from science and math to nutrition and behavior—all of which can be happily gained in the fresh outdoors of the garden. As a mother, gardener and outdoor educator for over fifteen years, my experiences have helped shape a vision I hold for the town I call home in rural East Texas. This vision involves children who understand where their food comes from, value their environment and healthy eating, and engage deeply in stimulating, hands-on education. 3rd grade Garden Bud marvels in her first carrot harvest. At first glance, the multitude of school gardens sprouting up around our country appears to be the latest trend in foodie culture. But school gardens aren’t a fad. Sure, we see a current upswing of interest; however, educators have long seen the value of children learning in the garden. Recently, there has been an exciting movement growing in Nacogdoches. If you haven’t heard about the horticultural happenings in our schoolyards, you are in for a treat of good news. It has been a truly awesome experience to support the revitalization project at the TJR School Garden, spearheaded by two of the most amazing and dedicated volunteers I know, Jim and Kerry Lemon. Three years ago, the Lemons had a vision for the empty garden boxes sitting adjacent to the TJR soccer field. With the support of volunteers from Resilient Nacogdoches and the Austin Heights Earth Care Ministry, the couple created a weekly program serving students during their elective time. The Lemon’s vision was fruitful and has inspired offshoots of over a dozen school and community gardens in the 2017-2019 school years. Wow! 3rd Grade TJR School Garden Buds harvest fresh mustard greens. Moore brothers help water the Carpenter Elementary School Garden. Last year, 3rd grade teacher Mike Moore and I reclaimed the dormant beds at Carpenter Elementary by creating an after school Gardening Club for 22 students. Fredonia Elementary and Head Start have taken off with raised beds, offering weekly vegetable gardening lessons. Brooks Quinn Jones Elementary recently received an education grant from Lowe’s. They have hit the ground running, starting their first edible garden this spring and building an outdoor classroom, Class in the Grass. At SFA Gardens, we have built a native edibles garden and playscape at the Pineywoods Native Plant Center, where we teach weekly gardening and culinary lessons to Boys and Girls Club students. And the list is growing. There has been exponential growth this past 2017-2018, with over a dozen new school and community gardens sprouting up in this year alone. Garden-based learning is integrated and so are its benefits. I have seen students who literally gag at the thought of eating kale on their first day of Garden Club who quickly become happy eaters of Every. Single. Thing. We. Grow. And yes, I’m even talking about turnips and cauliflower! Children witness the magic of tiny seeds that sprout bigger each week as they nurture their plants until they begin to recognize actual vegetables, so of course students are eager to eat the fruits of their labor. Research shows this openness to trying new foods follows students outside of the garden with an increase of daily fruits and vegetable consumption. 2nd Grader at TJR is excited to try new vegetables at the end of the season Harvest Feast. Beyond improved eating habits and nutrition, children are expected to be team players and learn how to problem solve with their peers. Garden Buds do meaningful work with real tools; their accomplishment is reflected in their boosted self-esteem. Furthermore, children and adults alike benefit greatly from getting outside and moving throughout the day. 3rd FBI (Fungi, Bacteria and Invertebrate) Agents investigate the soil for organic and inorganic matter. A children’s garden is full of learning for all ages. 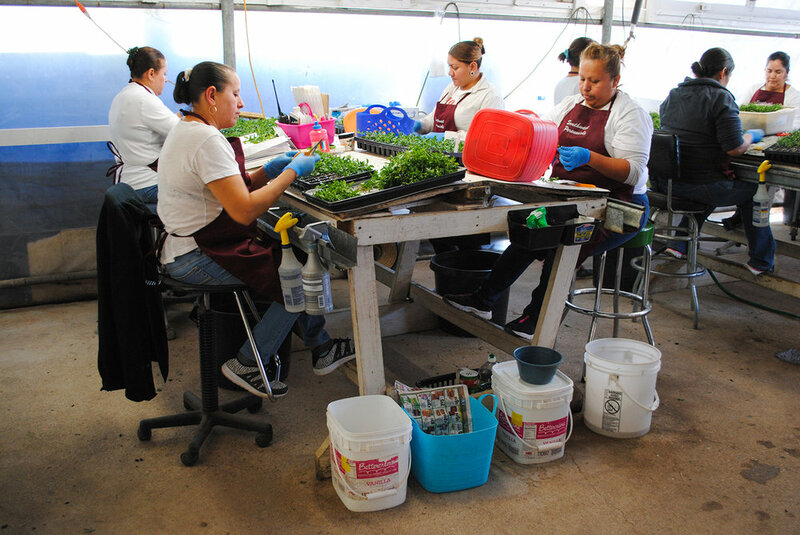 Volunteers and teachers often learn gardening skills right along with their students. As a bonus, volunteers develop a resilient network that cares for each other and the needs of their community. Many partnerships have been formed in the school gardening movement. SFA student groups and interns have played an important role in supporting volunteer-powered programming. Nutritionist intern Nathan Slinkard taught students about cooking and healthy eating, developing recipes and nutrition games for students. Student president of the Environmental Awareness Movement (TEAM), Tom Knapp, spent a semester helping to coordinate SFA student work parties, community events, and implemented a rain catchment system at Carpenter Elementary. Volunteers show off their hard work, building rich soil and creating pathways for Nacogdoches Naturally, an afterschool gardening club at the SFA Gardens Pineywoods Native Plant Center. Claudann Jones, Shannon Morrison and Ashton Logsdon are All Stars at the Texas A&M AgriLife Extension, assisting in grants, workshops, consulting, and a myriad of culinary and gardening support! Rachel Payne showing bees to visitors on her homestead. She brings an observation hive to school gardens for kids to view the bees through a class panel. Rachel Payne, member of the Pineywoods Beekeepers Association, gives her time regularly as a special garden guest showing off bees in a mobile, handmade observation hive. Pineywoods Permaculture and Theron Beaudreau, holistic land consultant and teacher, lead workshops and service learning projects in the community about organic and holistic gardening methods. The Healthy Nacogdoches Coalition has helped to connect these folks, and many others, together with monthly meetings. If you would like to join us for a lunch, speaker and Nac Gardens Alliance meeting, you are welcome! Please contact Jocelyn Moore at moorejv@sfasu.edu for details. How do we ensure that these gardens and children continue to flourish? While gardeners add fertility to our beds each season to ensure future growth, how can Nacogdoches support the health and longevity of these budding programs? According to researcher Heather Ohly, who has evaluated existing literature on school gardening programs, she cites that a “lack of funding and over reliance on volunteers” has been a hindrance to long-term viability of these programs…” We’ve seen first-hand in the short history of school gardening in Nacogdoches that teacher, volunteer, and grant-based programs evaporate once those key people are no longer involved. School gardening volunteers advocate for the importance of paid coordinator positions at the elementary, middle and high school levels to guarantee longevity of the volunteer-driven programs. SFA Phi Delta Theta worked hard this fall to revamp the beds at Carpenter Elementary. There’s plenty of research that illustrates the power in garden-based learning: improved nutrition, physical activity, behavior and academic outcomes. But nothing beats seeing it before your own eyes. If you’d like to support the ongoing efforts of the Nac Gardens Alliance by volunteering, fundraising, and/or connecting with city officials, please email Jocelyn Moore at moorejv@sfasu.edu. We also host seasonal work parties: a great way to get exercise, meet new folks, learn something new and serve your community! To see more photos and inspiration, check out a presentation I shared with the Healthy Nacogdoches Coalition. A Tremendous THANK YOU to Volunteers and Grantors! Full, topical bibliography compiled by Emory University graduate student and Nacogdoches School Garden Alliance volunteer Jordan Johnson. Ohly, Heather et al. “A systematic review of the health and well-being impacts of school gardening: synthesis of quantitative and qualitative evidence.” BMC Public Health. Vol. 16, No. 286. 2016. The great 1,500–2,000-mile Monarch migration is one of the most mysterious trademark phenomena of North America. This beautiful butterfly, given its name by early European settlers who named the creature “monarch” after King William, also known as “The Prince of Orange” (Urquhart, 1987), continues to delight gardeners as it makes its journey. However, concerns about its numbers are growing. From 1999 to 2010, Monarch populations have declined by 81%. This drop is due to a decline in milkweed (Asclepias spp.) growing in agricultural fields and an increase in herbicide use because milkweed is considered a weed in agricultural settings (Pleasants & Oberhauser, 2012). However, a weed it is not! Milkweed is the only plant that Monarch caterpillars feed on. Without it, the Monarch cannot carry on with its life cycle. Milkweed also attracts other pollinators into the garden when it blooms throughout the year. Whether you are a gardener, landscape designer, or just like to grow plants on the porch or balcony, you can participate in the conservation of this great species by growing milkweed. There are various things to consider if you plan on incorporating milkweed into the landscape. Timing is very important because Monarchs absolutely need milkweed during the spring migration (Dole, 2003). It takes three generations in the spring to make the journey to Canada so they need the milkweed to successfully reproduce during this part of the migration. In the fall, only one generation makes the migration South; therefore, they need plants that produce greater numbers of pollen for energy consumption until they get to Mexico. With this in consideration, the most important time to have milkweed in the landscape is during the spring. High pollen producing plants can be grown during the fall (Dole, 2003). When selecting the species of Asclepias to grow in the landscape, preference should be given to local species because they are better adapted to the environmental factors of the region. You can look at the Biota of North America Program’s Asclepias page to figure out which species grow locally in your region (Monarch Joint Venture, 2017). Since milkweed is native to North America, you can grow any species you want without having to worry about it becoming invasive. It is believed that certain species are poisonous, so it might be a good idea to keep pets away. In Mexico, some people refer to milkweed as “locoweed” because it supposedly causes insanity among livestock (Urquhart, 1987). Asclepias tuberosa flowers in an open field and provides food for Monarch caterpillars. This picture is of a milkweed species (Asclepias tuberosa), shown with its seed pods, that is found in the southeastern region of the United States. When this particular species is in bloom, the flowers are orange! Gardeners could also have their garden certified as a Monarch Waystation. For more information regarding Monarch Waystations, you can visit the Monarch Watch website. Another way that you can help Monarchs out is by growing plants that create adequate ground cover around the milkweed. This will make pupation easier and safer for the caterpillar when it reaches this stage. The picture below was taken within a foot of an adjacent milkweed plant where a caterpillar used the grass as cover during pupation. The chrysalis was left behind by a butterfly either during the previous spring or summer. The picture above was taken within a foot of an adjacent milkweed plant where a caterpillar used the grass as cover during pupation. The chrysalis was left behind by a butterfly either during the previous spring or summer. Agricultural practices and increased urbanization have had a huge impact on the Monarch butterfly’s success in North America. Growing milkweed to aid Monarchs could also serve as an educational benefit to children, growing conservationists, or to the general public. As gardeners, we have the opportunity to participate in the conservation and success of this great species. Every plant makes a little difference! Dole, Claire Hagen. 2003. The Butterfly Gardener’s Guide. Brooklyn Botanic Garden Inc. Brooklyn, NY. Urquhart, Fred A. 1987. The Monarch Butterfly: International Traveler. Nelson-Hall Inc., Chicago, IL. Pleasants, John M. and Karen S. Oberhauser. 2012. Milkweed loss in agricultural fields because of herbicide use: effect on the Monarch butterfly population. Insect Conservation and Diversity. 6: 135-144. Recently, SFA students attended the International Plant Propagators Society Southern Region in Dallas, Texas for a day of educational lectures, inspiring horticulture tours, and great networking. I asked each of them for three takeaways they had from the experience. 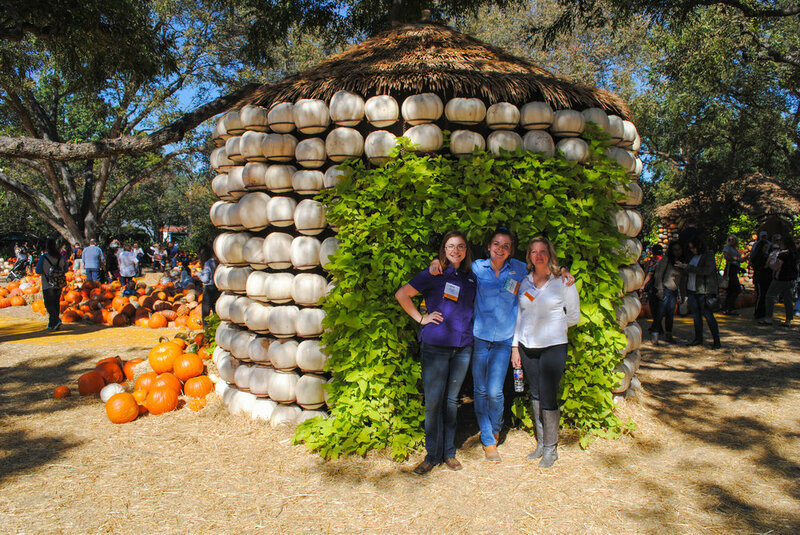 SFA students Anna Claire, Jade, and Laura stand in front of a pumpkin house at the Dallas Arboretum's Wonderful World of Oz. 1. I really enjoyed seeing the water retention system at Green Lake Nursery. 2. I also loved the overview and pictures of the gardens in England. 3. I enjoyed learning about different opportunities in the horticulture world and meeting people in the field. 1. The first thing that intrigued me was the student presentation over an experiment that tested whether mixing auxin with alcohol caused chemical burns to the plant. I found this interesting because it proved common conceptions to be wrong while also presenting a new reason as to why this burn happens. 2. During our trip to the Dallas Arboretum, I found the trial gardens to be exciting because we are looking at new cultivars that could possibly only be found there. There was also a luffa plant, which is my new found favorite. 3. Finally, during our tour of Southwest Perennials, I found their propagation process mesmerizing. Seeing those women pump out plugs reminded me of all the small people in the industry and how they are the most important. Without their attention to detail and efficiency the whole business would be in shambles. Overall, while the trip enlightened me on the business aspects of horticulture, it reminded me of the art of horticulture. 1. I loved visiting the Southwest Perennials farm. I liked that they stay true to their quality and products and that they work with the city and share the park area in trade. 2. I also loved the Dallas Arboretum. I plan on visiting there again and seeing the whole thing with my children. 3. I enjoyed meeting other people in the industry. It feels very like a very welcoming and genuine industry. Jenny Wegley (second from right), Dallas Arboretum Vice President of Horticulture Operations and SFA Horticulture alumni, greeted current SFA students and Dr. Jared Barnes at the Dallas Arboretum. SFA students were able to see great attention to detail in propagation at Southwest Perennials. Perky pansies at Green Lake Nursery. 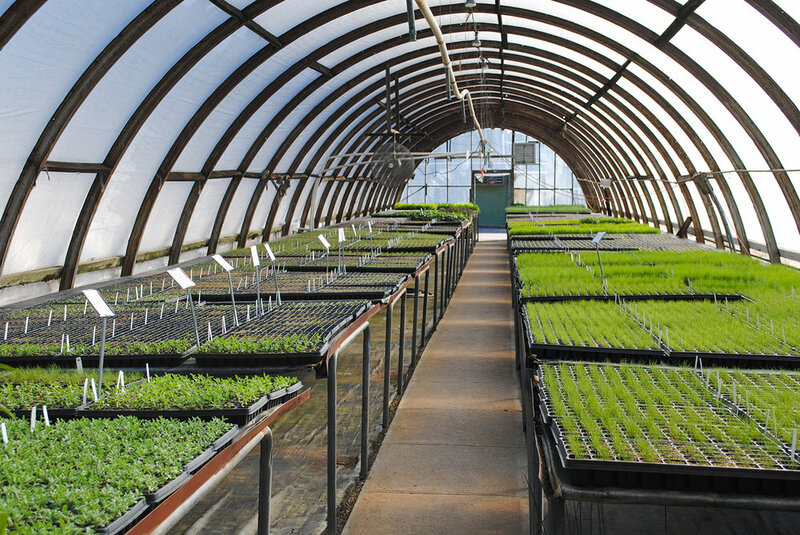 Green Lake Nursery also specialized in various hardy succulents and xeric perennials. Written and edited by Jared Barnes, Ph.D.